Gift certificates are available in $50, $100, $250, $500, $1000 vouchers. The voucher can cover photographic art from the gallery, products from the store or a photo-tour or a wilderness experience. We can email or mail the voucher to the recipient. 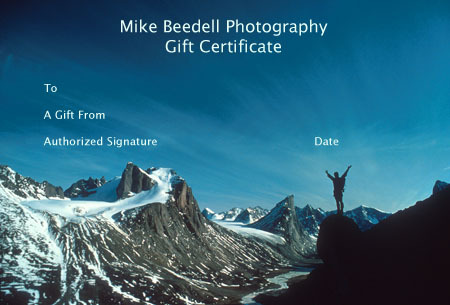 Payment for the certificate can be made through paypal with a credit card, cheque or money order made out to Mike Beedell Photography Inc.